The Uttarakhand Health Minister Dr Ramesh Pokhriyal ‘Nishank’ today flagged-off Mobile Medical Vans for seven districts of the state, at the Director General Health and Family Welfare Office. A member of the paramedic staff inside a mobile medical van. at par with private institutes. Under the National Rural Health Mission, the state government is aiming to bring health services at the doorstep of the citizens. “The vans equipped with X-ray and other diagnostic machines will prove beneficial for the people living in the remote districts of the state. The performance of the programme would be evaluated after every three months. To improve the efficiency a special award would be given to the van providing best services,” he said. The vans on Public Private Partnership would be operated by mother NGOs comprising of Gomti Jan Prayag Sansthan, Ambuja Cement Foundation, Shri Bhuvneshwari Mahila Ashram and Himalayan Institute Hospital Trust. Dr Ramesh Pokhriyal said the state government has taken up several steps for expanding health services in the state. “For the first time a scholarship based medical education scheme that will cost Rs 15,000 per annum has been launched for the meritorious students in the state. A BSc Nursing College has also been set up along with ‘Rajkiya Mansik Chiktsa Sansthan in the state,” the Minister said. 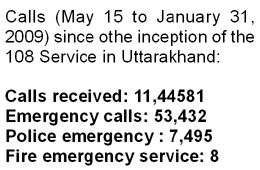 In one year, the 108 Emergency helpline has made its presence felt by providing assistance to about 34,000 cases. It has become an example in public-private partnership which is growing by leaps and bounds. The helpline, which is dedicated to the cause of medical emergency in the state, is proving to be a boon to the people, specially in hill districts. The good news is that another 18 ambulances have been introduced within three months in addition to the already existing fleet of 90 vehicles. The 108 Emergency helpline is a joint venture of the state government and the Emergency Management and Research Institute (EMRI). It was started in Uttarakhand on March 8, 2008. Apart from Uttarakhand, the helpline is being successfully run in Andhra Pradesh, Rajasthan, Madhya Pradesh, Goa, Assam, Karnataka and Gujarat. Anup Nautiyal, COO, EMRI, said the EMRI had signed a memorandum with Stanford University to impart training to medical staff, paramedics and trainees. A feature that not many people know is that the 108 dial service can be used for giving information related to crime, terrorism and fire too. At the Dehradun call centre office, this information is received and then forwarded to the nearest police station by personnel present at the call centre helpline office. There are 670 staff members in the state who work round the clock and what sets them apart is the time taken to reach the emergency. In the hill districts of Garhwal and Kumaon, the helpline, on an average, takes 27 minutes to reach the spot while in the plains like Dehradun, Haridwar, Rishikesh and Roorkee, it takes just 17 minutes. There are two types of ambulances at EMRI-108: Advanced Life Saving (ALS) and Basic Life Saving (BLS). BLS ambulances are fitted with different types of stretchers, two oxygen cylinders, oxygen masks, BP apparatus, pulse oxymeter and ECG monitor. ALS ambulances have two additional equipment - defibrilator and ventilator. But one problem that people in hill districts encounter is that the 108 number is not accessible at times in the absence of full coverage by cellular services. Anup Nautiyal said one could use the 0135 STD code as prefix in case they encountered this problem. She requested the people not to call up for minor problems as the service may be needed for urgent cases. Though the salary and perks are not in consonance with their toil, the staffers believe that the love and recognition they get from the people amply compensates for this.Health services on wheels. Terming stem cell therapy as a boon for the common man, Dr CM Habibullah, an eminent stem cell scientist and director, Deccan College of Medical Sciences and Allied Hospitals and Centre for Liver Research and Diagnostics, Hyderabad, says the cost of the therapy is expected to come down soon. Speaking at a two-day national symposium on “Emerging trends in Biomedical Sciences” at Sardar Bhagwan Singh Postgraduate Institute of Biomedical Sciences and Research, Balalwala, he said stem cells, because of their self-sustaining and replication characteristics held promise in the treatment of debilitating diseases like heart and liver ailments, spinal injuries, the Parkinson’s and Alzheimer’s disease, retinal degeneration, muscular dystrophy and diabetes. “Clinical applications have been reported in heart diseases, spinal cord injury, ischemic limbs, retinal degeneration and liver diseases. But the cost of the therapy, ranging between Rs 32-Rs 40 lakh may not suit every pocket. For, large-scale use, scientists have to undertake several experiments to ascertain that it is safe and does not have side-effects. Stem cell trials on human beings underway in the country were in the experimental stages but these held hope against life-threatening diseases and in the coming years, the therapy could become affordable, Dr Habibullah said. “So far scientists have been satisfied with animal trials and the results in most cases have been good. However, we need more refinement and more research in order to make stem cell treatment reliable. “Stem cell research is a new field. Scientists for years have looked for ways to use stem cells to replace cells and tissues that are damaged or diseased. “Scientists in Ahmedabad have even claimed to have used the stem cell therapy successfully in spinal code injury. Even liver transplant cases have been successful, but we need to do more research,” Dr Habibullah said. Prof N. Uduppa of Medical College of Pharmaceutical Sciences, Manipal University, said stem cells technologies would eventually lead to stem cell-based therapeutics for prevention, diagnosis and treatment of human diseases. “In future, nanotechnology will provide the cutting edge to the drug delivery system; the nanocarriers will directly target the effective tissue speeding up recovery,” he said. The Director of the institute, Prof AK Sharma, said the symposium would help students enhance their knowledge about progenetics, probiotics and biochemistry. The much-hyped government claim of having increased the number of government B.Ed institutes to accommodate the huge demand of admission to B.Ed course in the state has failed to enthuse admission-seekers, allegedly due to the fact that the fee structure is at par with private institutes. At least, this seems to be the case of the eight government-run self-financed B.Ed institutes in which more than 60 seats are left unfilled after counselling concluded earlier this month. Of the 2,100 candidates shortlisted by HNB Garhwal University after the entrance test, only 1,100 had appeared for the counselling for admission against 800 state-quota seats in these institutes. “We did not appear for counselling after we came to know that the course fee for these institutes will not be the same as charged by existing government and aided colleges running this course,” said some students who did not wish to be named. “The hoardings put up all over enlisting the government’s achievements took us in. These mentioned that the number of the government B.Ed colleges has been increased from four to 22 and the number of seats was up by 3000,” they added. As per the existing fee structure, a student has to pay Rs 3,175 for the entire one-year course in a government college. However, in a government institute under the self-finance scheme, the fees charged will be Rs 30,000 in a year. “What is the difference between a government-run and a private institute. It amounts to befooling the students and their parents as the government deliberately concealed the fee aspect in the hoardings,” alleged Mukesh Bhandari, president, HNB Garhwal University Students Union. The candidates who have accepted letters of allotment of seats in these eight institutes haven’t done so gladly. “I have no alternative given the huge rush for admission. It is very difficult for my father, who is a small farmer, to arrange Rs 30,000,” said a student hailing from a village in Srinagar Garhwal. “I cannot, at this stage, even surrender the allotment letter because the candidates doing so will not be considered for the state-quota seats in the private self-financed institutes for which counselling is yet to start.